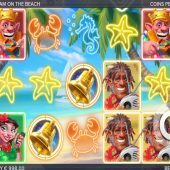 Sam on The Beach slot will immediately raise your eyebrows if familiar with Elk Studios' other game 'Electric Sam' and you'd be right! It's our old friend Sam again this time enjoying the sun, sea and his bunch of odd friends. We have 5 reels of 3 rows and no pay lines as the game is a 243-way slot. The reels spin over an attractive background of palm trees and the symbols with the exception of the Wilds are stacked up to 3 rows high, underscored by some nice tropical - style soft music. Instead of card symbols the lower values are outlines of crabs, shells and starfish with lowest paying 4x stake for 5-of-a-kind and the highest crowned Sam character 20x for the same. Wilds can only appear on the centre 3 reels and golden bells are the game's scatters. There is one very interesting and usually lucrative in - play result. Should you land Sam's 4 family members' characters consecutively on any horizontal way i.e. centre of reels 1, 2, 3 and 4 they will all turn into Wilds and stick for a Beach Memory respin. This is the only time you can get a Wild outside of the middle 3 reels and maybe see 2 on a reel if any more appear on the respin. You are virtually guaranteed a sizeable win when this comes in! Sam win - This will mean a random symbol becomes a sticky wild for the remainder of the free spins. Sandra win - This will mean she flings multipliers to the game for any wins that occur until the end. Maggie win - This means she will fire her harpoon at the reels to create wins by removing low value symbols. Ted win - This leaves his crackly radio behind with a sticky multiplier on it. You may be lucky and get more than one enhancement in play at once!